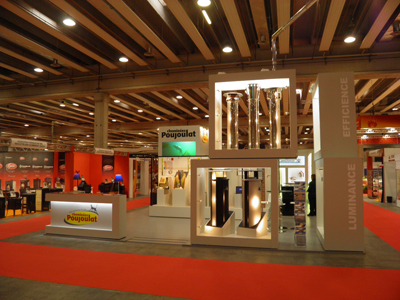 Please come and visit Poujoulat at the Progetto Fuoco exhibition. Wood energy in individual dwelling with EFFICIENCE, concentric chimney - designed for the new generation of high efficiency wood appliances - allowing the connection of combustion air and smoke exhaust with one and the same chimney, PGI concentric stainless steel chimney for pellet stoves and the COQISOL system for air tight dwellings securing the continuity of the insulation in the loft space and the distance to combustible materials. Innovations with TOP CLEAN, the electrostatic filtration solution both for renovation and new installations, ZERO CO the catalytic convector for wood burning appliances which are not complying with current standards anymore. Design and personalisation with the Luminance and Optimale chimney stacks and the whole range of finish for the Inox chimney stack.